Friday February 1, 2019-Judiciary is in yet another trouble with the Director of Public Prosecutions (DPP) and the Directorate of Criminal Investigations (DCI) as far as fighting terrorism is concerned. 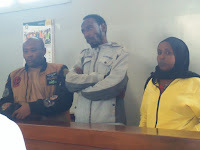 This is after a court in Nyeri set free three suspects who had been arrested in connection with Riverside terror attack that claimed the lives of 21 innocent civilian. According to the court, the three were set free on grounds that the Anti-Terror Police Unit (ATPU) lacked enough evidence to convict them. The three Abdul Kibiringi, James Mwai and Habiba Hunshur had been arraigned in court on Monday in connection with the Dusit attack and ordered to spend five days in Police custody as investigators sought to obtain their call logs. They were arrested on Friday last week over claims that initial investigations linked them with other suspects in the terror attack at Dusit complex. This comes even as there is constant onslaught against the Judiciary for letting free suspects engaged in corruption and terrorism. Chief Justice David Maraga may now have to explain to the families of the 21 victims as to why suspects were released despite causing their kin to die in cold blood.